There are some players who know their gear well, and others that have an intimate relationship with that gear. Brad Paisley is certainly in the latter camp, carrying preternatural knowledge of how the gear he’s chosen helps shape the tone that is all his own. Brad recently invited us backstage (and onstage) to talk about his signature Santa Cruz, the forthcoming Fender Brad Paisley Signature series, a new Dr. Z amp called the DB4, and plenty more. It’s no secret that Brad loves Telecasters. His 1968 Fender “Old Pink” Paisley Tele generally stays at home while he’s on tour, but the arsenal that travels with him is as impressive as any. Vintage enthusiasts will fawn over the ‘52 Blackguard, which now sports a blue paisley pickguard, of course, and a bender. Both of those collector-grade guitars were luckily spared from the great flood of 2010 in Nashville. A myriad of Crook Guitars, built by master luthier Bill Crook in Nashville, fill out the rest of the road collection. These custom-built beauties have a variety of finishes, electronics and neck specs, some of which are answers to Brad’s requests while others include features that Crook suggested Brad check out. Crook prides himself on building guitars with a specific player in mind — and who better to build for than Paisley? Brad also confirmed rumors of a forthcoming Fender Brad Paisley Signature guitar line slated for later in 2016. "I’ve really taken control in the last year of making sure that the things that I’m playing such as this [Santa Cruz Brad Paisley Signature]," Paisley says. "When someone buys an instrument with my name on it or in some way that I recommended or had something to with, I want it to be great. It’s really been fun to develop a Telecaster with Fender. I’ve been really involved in picking out what becomes of that guitar, and the one you saw is going to be really affordable, too. It won’t be out for a little while yet; we’re still refining." When someone buys an instrument with my name on it, I want it to be great. More news on that as it comes in. During acoustic portions of the set, his Santa Cruz signature, which was released at Summer NAMM 2015, dominates. He keeps the No. 1 at home while he globe-trots with this one; the only difference being an installed L.R. Baggs pickup. He also tours with an inventory of Fender acoustics on hand and at every show gives one away to a lucky member of the audience. Again, it’s no secret that Brad loves Dr. Z amps. There was a whole tour where giant Z cabs were the backdrop to his live show experience. 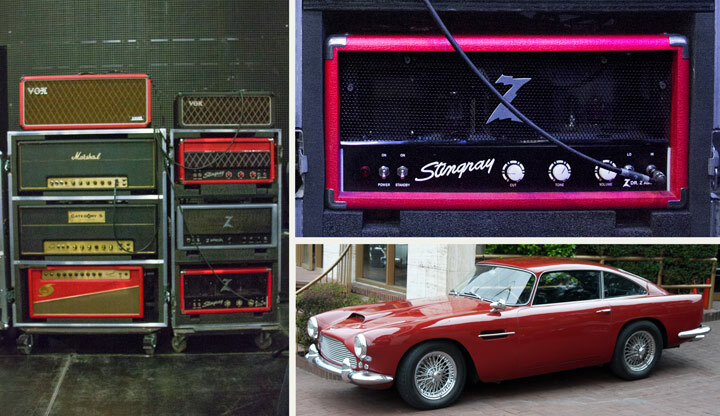 On the Crushin’ It tour they aren’t giant, but there are certainly plenty of Z cabs powered by the EL84-driven Z-Wreck and what looks like a Stang Ray head, but Brad told us another little secret. As with Brad’s relationship with Crook, his relationship with Mike Z., the doctor, yields special projects, too. The main Z circuit driving those speaker cabs is a forthcoming model: the Dr. Z DB4, which according to Z himself, “designates Doc and Brad’s fourth amp collaboration, and also is a vintage model Aston Martin.” This new amp uses a 5789 pentode tube in the preamp section — a tube used in the old Gibson GA-40 Les Paul amplifier — and has a rotary selectable tone control. Expect to see those hit the market in summer ‘16. Other notable drool-worthy pieces include a 1970 Marshall Super Lead, outfitted with a variac, and a Vox AC-100. Being backstage at a 20,000-capacity stadium with a top-tier artist, you might expect to see a lot of glitz and glamor. In real life — or at least in this instance — what you find is a humble crew of true-blue people who are more than happy to show you the inner workings of road life.